Baton Rouge, LA – January 11, 2012 – Vancouver City subway passengers will now be greeted with a bright, interactive wakeup call on their commute to work. Lamar Advertising Company (Nasdaq: LAMR) has partnered with Monster Media Canada to light up the public transit system of Canada with their Monster Wall: the first interactive large LCD screen in a Canadian public transit system. Located in one of Canada Line's highest traffic stations – Vancouver City Station – at the corner of Granville and West Georgia, the Monster Wall sits in the heart of downtown Vancouver's busiest business, retail and entertainment districts. Canada Line's Vancouver City Station experiences an average of over 750,000 boards monthly. 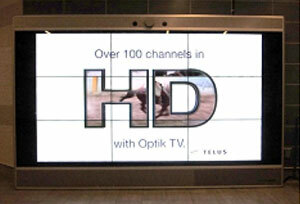 The Canadian Telecommunications company TELUS is the first advertiser to launch a campaign on the Monster Wall screen. 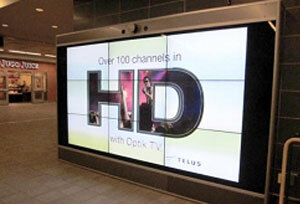 Images shown: Monster Wall located in Canadian public transit system. Monster Media Canada is the leader in the technology and content development, innovation and deployment of this unique out-of-home experience. 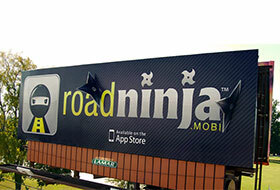 With over 1,000 interactive program activations globally, Monster Media's track record speaks for itself. Lamar Advertising plans to roll out more interactive Monster Wall units in other high traffic locations inside Vancouver's rapid rail transit systems over the next 12 to 18 months.